Thailand is a Buddhist country so Christmas is not a holiday. Neither is Boxing Day, the day after. 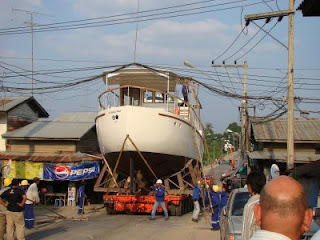 Which is just as well, because my crew and I had to be on hand to oversee the lifting of the recently launched TS60, De Nieuve Maan (or New Moon), a traditional gentleman's motor yacht designed by Albert Nazarov, from the water onto the deck of a cargo ship which will carry it to the Netherlands. It was a slow, nerve-wracking operation – with the worst moment being when the TS60 was suspended in a sling over the ship's wide steel deck. It was then lowered slowly and carefully into its custom-built steel cradle before being lashed to the deck and covered.. Everything went off without a hitch and the ship is already well on its way with its valuable cargo. 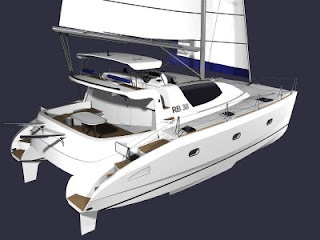 Soon to be completed at the RB yard near Jomtien is the first of a new generation of production sailing catamarans designed by Albert Nazarov. The RB38 is a development of the highly successful RB34, Thailand's first production sailing catamaran. The very comfortable, reasonably economical, moderate displacement motor-sailer will be delivered early next year to a Swedish client. Over the years, my yard has built several, environmentally friendly electric boats for use in protected inshore or river waters, including five 18-footers delivered to Vancouver and a 42-foot cat powered by two 20hp electric outboard motors. Among the most attractive are three, 21-foot open, Picnic day-cruisers delivered to California, USA, and Holland. Ideal for a small river cruising or a self-skipper rental fleet, they are traditional-looking and yet very comfortable, with low-impact, zero-polluting power. It would be great to see more of these launched. One of my newest – and smallest – projects is a small catamaran, the RB26, also referred to as the Crocodile. 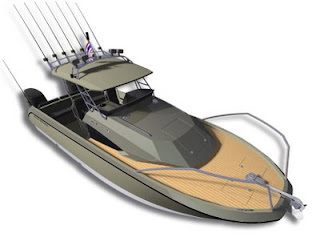 Designed with an unusual, 'stepped' hull shape, she is part high-speed power cruiser, part sport-boat. Powered by two 115 to 150hp outboards, sheshould have a top speed around 45 knots. The molds are currently under construction at a partner yard in Pattaya and with luck, a prototype should be launched in February, next year. The TS60 launch went without a hitch. The owner was happy – and in the end, that's the most important thing. The vessel itself, the largest yet launched by my yard, is very handsome, with plenty of old-world style. It also performs well and passed its acceptance trials with flying colours. Today, we tackled the first stage in the launch of the biggest vessel in our company's ten-year history, towing the Albert Nazarov-designed TS60, now named The New Moon, to the one site deep enough to accommodate its launch (on a spring tide) – a local naval base! It was an extraordinarily complicated, long operation, involving a custom-built movable cradle with no less than 50 wheels, a heavy-load crane, a long, flat-bed low-loader trailer and several dozen personnel, some of whom were charged with lifting high voltage, overhead electricity wires away from the coachtop and deck with forked bamboo poles. Moving an RB-built vessel to the sea always causes extended traffic delays on the busy Sukhumvit Highway to Bangkok and this was no exception – indeed, today was memorable for the chaos it caused! – although locals still managed to derive plenty of entertainment from the slow procession of the vessel and its support team. What is about catamarans designed by James Wharram? When it comes to sailing blogs, a very high percentage of them are written by people building or sailing Wharram's Polynesian-inspired 'double-hulled sailing canoes' all around the world. 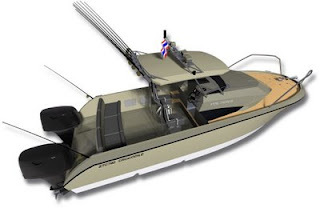 Creed O'Hanlon, who commissioned me to build his Wharram Tiki 38 in red cedar strip-plank composite, drew a lot of attention to my Jomtien yard with his widely read blog, A Tiki In Thailand. Now he has been joined by another of my clients, Warren Matthews, whose new blog, Natural High Adventures, tracks the construction of a sistership (photo above) at my Thepprasit Road yard, also in strip plank composite. Raoul Bianchetti founded his boat-building company, RB Power & Sailing, in Thailand in 1998. From just one employee – himself – it has grown rapidly to encompass two large yards employing nearly 100 local workers working on as many 20 projects simultaneously. RB Power & Sailing is best-known for its economical but stylish RB range of power and sailing catamarans, as well as a large number of custom-built, high quality yachts from 15 to 150 feet in length.